Constance Mackworth-Young Previous A-Theme liaison at the MARCH Centre LSHTM. 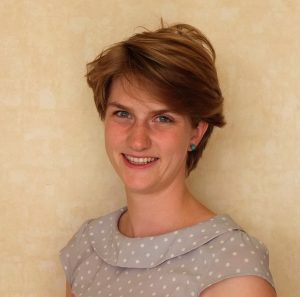 You may have seen Constance’s name featured in our Theme-A February newsletter, as a first author of a research publication ‘“My mother told me that I should not”: a qualitative study exploring the restrictions placed on adolescent girls living with HIV in Zambia’. But Constance Mackworth-Young’s relationship with the MARCH Centre began two years ago when she served as the MARCH A-Theme liaison at the LSHTM. Today, she is in Zambia, conducting her PhD with LSHTM and working with Zambart, a Zambian research organisation focused on HIV and TB research. Constance’s research focuses on adolescent health, specifically with adolescent girls living with HIV in Lusaka, Zambia. We spoke to Constance about her experiences working in the adolescent health sphere after graduating from LSHTM to learn more about her work in Zambia. Can you share a bit about your background, and area of interest in adolescent health? My background was initially in anthropology, both biological and social anthropology. I started working in public health first in policy, doing an internship at the WHO in Geneva and then at a UK based global think tank Meteos, working on access to medicine. After three years of working in public health policy, I wanted to work in a more connected way with people who were affected by the public health issues and policies that we were working on. I moved to Zambia to work with a Zambian research organisation called Zambart. I worked together with the Zambart social science team, led by Dr. Virginia Bond, who is also based in LSHTM. This is where my interest in adolescent health really developed. I started working on a qualitative study with adolescent girls living with HIV and I really enjoyed hearing their stories of incredible resilience while dealing with various challenges that they faced. After working in Zambia for a while, I wanted a more active role in my research and so I undertook a Masters’ at the LSHTM. After that I started a PhD at LSHTM, funded by ESRC, that has led on from our initial research with adolescents living with HIV. Can you share a little bit more about the stories of resilience and challenges by these adolescents? A lot of research often focuses on the challenges adolescents face. Our research has also looked at these issues, including around treatment and disclosure. One of the key findings was that many participants have never opened up to a single person about their HIV status, which comes with other challenges around keeping treatment hidden from people. But to me, one of the things that I loved and that I find really exciting about my work is hearing more about the stories of resilience, hopes and aspirations. One of my favourite quotes from a participant is:“HIV will not stop me from achieving my dreams; it will not stand in my way for anything that I do”. That level of resilience and desire that HIV will not stand in their way is something that I think is really important to highlight. Are there any themes you witnessed in your research on how adolescents came to dealing with disclosure, coping with their status and becoming more confident as young women? The participants that I am now conducting ethnographic research with were recruited almost 4 years ago. They have gone through about 1 year of doing research with us at Zambart, and then they had 1 year of participating in support groups that we ran after the research, before taking part in a follow-up ethnographic study. I think the support groups have been really valuable for many of the participants. Mostly, I think meeting other people through support groups who are similar ages and coping with similar challenges is so valuable to understand that they are not alone in going through these challenges. With the incredibly limited disclosure that we saw, most adolescents had never openly spoken with or met with other people their own age living with HIV. We are now piloting a support group curriculum in two clinics to see if that is feasible and if it can impact young peoples’ aspirations, self-confidence and self-stigma. Thank you so much for sharing that. How do you feel like this research would have a longer-term impact on the local communities? I think this is a really good question and something we should always be asking when doing research. From the qualitative research, we saw the participants were actively asking for a support group and saying ‘what would really support us is meeting other people like us and being able to talk about issues’. At the moment in Zambia there are support groups in some of the clinics but often there isn’t continuity or consistent funding to be able to ensure they are ongoing. The support group curriculum that we are piloting was developed based on recommendations from adolescent girls living with HIV. I think that is a really powerful way that can have an impact. 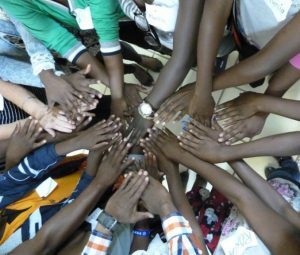 Globally, it is becoming increasingly recognised that adolescents, and specifically those living with HIV, have in the past been left behind and this increased focus means there’s real potential for improvement in adolescent health. But I think that in order for that potential to be realised, one needs to have in-depth understanding of what adolescents living with HIV really need and how they can best be supported. I see doing more in-depth, qualitative and ethnographic work as providing valuable evidence of the every-day life of adolescents living with HIV to ensure that investments in adolescents living with HIV support their real needs. Do you see any challenges in your day to day work, and trying to communicate your research and impact in the local communities? One of the things I am focusing on specifically is about research ethics in doing research with adolescents. Partly, I am interested in it because it is something I come across every single day in doing data collection and working with participants, and I do think it is something that we need to think actively about. One of the aspects that I have been thinking about is how to actively involve adolescents in the production of knowledge, research, data collection and even in the analysis and presentation of results. I have been working with colleagues at Zambart to develop different research methods that are as inclusive as possible of young people. 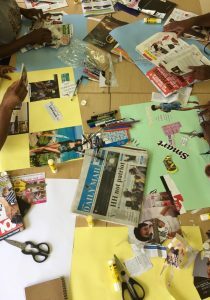 One of the methods that we have been developing is using art-based collages, where participants cut out magazines, write words and draw pictures on cards to involve young people in creating their own representation of themselves. 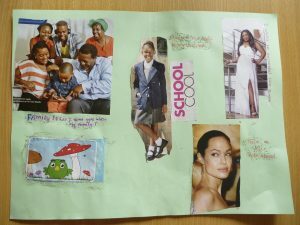 I have really enjoyed using this method I think that the participants really enjoy it too, as well as acknowledging that the collages present meaningful representations of themselves. Find something that really makes you excited and interested, and that you think is important to change. During your time with the LSHTM you were also engaged with the MARCH Centre. Can you talk a little bit on what your experience working with the Centre was? I think that the MARCH Centre does a really excellent job in bringing together a wide variety of people who work in similar fields at the London School and beyond. For me being a student liaison was a really exciting opportunity to connect with other researchers in different disciplines but focused on a specific topic of adolescent health. I think that the global health scene is really on the cusp of having this amazing focus on adolescent health and I think that the MARCH Centre has an important role in shaping how people at LSHTM and beyond build on, and influence the direction of this opportunity. Do you have any final thoughts or advice you would give to students at LSHTM and those interested in adolescent health? My advice around the field of adolescent health is that now is the time! Now is the time that people are really having so much excitement and huge focus around adolescent health, and there is the potential for real impact. My advice more broadly to students is to find a field that you are really passionate about. Find something that really makes you excited and interested, and that you think is important to change. Once you found that, feel really free to search out and contact people that work in that field. I think that particularly in the London School most people are very happy to meet with someone that has a passion in that field and a free pair of hands to help with a literature review, data collection or just to talk about their research in the field. For me finding an area of adolescent health that got me really excited and made my heart sing was a really important thing in order to then build an area of research that interested me, and that I felt was important. I would like to say thank you to Constance for taking the time to discuss with me about her important work in adolescent health and providing inspiring words of encouragement to current and future MSc students at the LSHTM.